You are here: Home › Learning home page › Module 2: Understanding EU Policy Making › But what does the Lisbon Treaty mean in practice? Well… like the TEC under the old first pillar, the TFEU primarily utilises the ‘community method’ where the Council, Commission and Parliament are all involved in decision making. 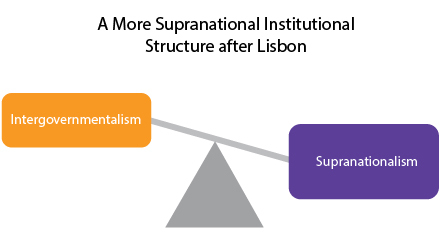 However, now under the new structure, most of the former third pillar areas are incorporated under the TFEU, meaning that the more supranational community method applies to an enlarged number of policy areas. Why is this important? The European Communities (EC) has always benefited from a legal personality, meaning above all that it could enter into international agreements and be party to legal proceedings (i.e. sue and be sued). The ‘EU’ however had a more ambiguous position in that it has entered into international agreements, implying that it did have a legal personality, but this was nonetheless disputed by scholars and practitioners. The EC and EU were the same organisations just arranged in different configurations and imbued with different legal responsibilities in different circumstances. This distinction between an EC that was legally recognised and an EU that might have been created problems with international partners, as they were often unsure of whether they were negotiating with the EU implying certain procedures, or with the EC implying a different set of procedural rules. The creation of a single legal personality for the EU removed these ambiguities and streamlined the process for international agreements into a single, more straightforward procedure.